A special donor recognition to acknowledge and thank our friends and family who have supported the Boys & Girls Clubs of Providence with an annual gift of $1,000 and more. We hold our wonderful BGCP Society event in September. At this time, we will be announcing the special 2019 BGCP Society Award recipient! Stay tuned! The 2018 BGCP Society Award w as presented to Judy Davis who embarked on a cross country bike ride to raise funds for the BGCP swim program and to establish the first swim Endowment in honor of BGCP Head Swim Coach, Ian Muir. 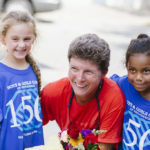 She stands behind her bike ride of 4,000 miles for 4,000 smiles to give teaching life-saving skills to our beginner swimmers, and to provide an area to practice for our more experienced swimmers in a safe and nurturing environment.! Congratulations Judy! 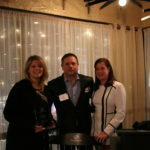 The inaugural 2017 BGCP Society Award was bestowed on Ed and Lisa Medeiros of East Commerce Solutions, Inc. who have actively demonstrated support for the not only the boys and girls who attend our Clubs but for their families as well. They partnered with our organization since the start of our golf tournament in 2013 raising over $450,000 in support for the Work Force Development Program, provided our families in need turkey and fixings baskets during Thanksgiving, and supplied toys and gift cards to the youth during the Christmas holiday making the holiday season that much brighter.